An additional open house opportunity was requested for the four properties originally shown on January 7. 3950 Bryant Ave. N.: 1:00 p.m. – 1:30 p.m.
3515 Girard Ave. N.: 1:40 p.m. – 2:10 p.m.
3534 Fremont Ave. N.: 2:20 p.m. – 2:50 p.m.
2701 Oliver Ave. N.: 3:00 p.m. – 3:30 p.m.
One staff person is opening, securing, and travelling between houses, so actual open times may be up to 5 minutes late. Please be patient and plan accordingly. 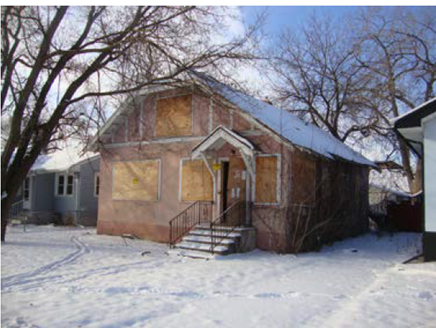 As posted on the vacant structure list, the due date for submitting an offer for these properties is January 28 by 12:00 p.m.
4640 Portland Ave. S.: 1:00 p.m. – 2:00 p.m.
2548 12th Ave. S.: 1:00 p.m. – 2:00 p.m.
701 Newton Ave. N.: 1:00 p.m. – 2:00 p.m.
916 Newton Ave. N.: 1:00 p.m. – 2:00 p.m.
1419 Upton Ave. N.: 1:00 p.m. – 2:00 p.m.
1426 Penn Ave. N.: 1:00 p.m. – 2:00 p.m.
1715 Oliver Ave. N.: 1:00 p.m. – 2:00 p.m.
2115 Bryant Ave. N.: 1:00 p.m. – 2:00 p.m.
2800 18th Ave. N.: 1:00 p.m. – 2:00 p.m.
3014 Logan Ave. N.: 1:00 p.m. – 2:00 p.m. The property pictured above is 4640 Portland Ave. S. All February properties have a due date for offers of 12:00 p.m. on February 25.